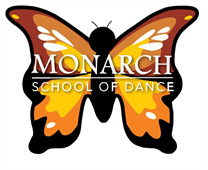 Welcome to Monarch School of Dance - Where dance dreams take flight! Please complete the registration information below and reserve your dancer's spot by submitting the $25 Registration Fee. Let's get dancing! Review and select classes for your dancer(s). Classes are organized by age group and dance style. Please reference previous teacher recommendations if applicable. I understand that dance classes may include, without limitation, dancing with props, stretching, barre work, across the floor combinations, dance routines in the center, and other related activities. I further understand that all of the activities of the dance class involve some degree of risk of strain or bodily injury. As the legal parent or guardian, I release and hold harmless Monarch School of Dance, LLC, its owners and operators from any and all liability, claims, demands, and causes of action whatsoever, arising out of or related to any loss, damage, or injury, including death, that may be sustained by the participant and/or the undersigned, while in or upon the premises or in route to or from any of said premises. A non-refundable fee of $25 per family is required yearly at the time of registration. Session I: September 10, 2018-January 19, 2019. Billed in 4 equal payments on September 1, October 1, November 1, and December 1. The 2018-19 season will consist of nine months of classes from September 10, 2018- May 31, 2019. Payments will be billed in nine, equal, monthly, payments starting September 1, 2018 and ending on May 1, 2019. Monarch reserves the right to place all dancers according to age, ability level, and experience. The 2018-19 season will consist of nine months of classes from September 10, 2018- May 31, 2019. Payments will be billed in nine, equal, monthly, installments starting September 1, 2018 and ending May 1, 2019. Placement by audition. Monarch may cancel, combine or re-schedule classes if minimum enrollment requirements are not met. 3.) Any declined auto-bills that remain unpaid by the 5th of the month will have a $10.00 late charge automatically applied. 4.) All tuition and fees will be posted online via the Parent Portal. 5.) Please see withdraw policy to have auto-billing cancelled. Tuition is non-refundable. 6.) Any dancer with a balance of more than 45 days will not be allowed to continue classes until payment in full is received. 1.) Monarch reserves the right to cancel any class with insufficient registration. Full refunds will be processed. 2.) Credit will not be given for missed classes due to illness, snow days, or personal commitments or vacations. Dancers may call/email to schedule make-up class(es) of similar style and level of class(es) missed. 3.) Registration Fees, Recital Fees & Tickets are non-refundable. 4.) Withdraws from class(es) must be submitted by a parent or guardian in writing to a Monarch director by the 25th of the month or your account will be auto billed for tuition. Attendance is very important for dancers at every age and ability level. Dancer absences should be reported, in advance, to the studio by email or text to 856-485-0943. Monarch reserves the right to sit out dancers who arrive 20 minutes or more late to class. Dancers should appear neat, clean, with hair secured and off the face. Proper dress code must be followed for every class including dance shoes. Monarch reserves the right to have unprepared dancers sit out of class. Refer to the Dress Code posted in the Parent Portal and website for details on general studio policies and dress code. Monarch will make every effort to communicate studio information, policies, payments and important dates to parents via email, Parent Portal, text messages, and Monarch website. A current email address for parents and guardians must be kept on file at all times during the dance season to ensure timely receipt of information. We also encourage you to opt-in to receiving text messages from Monarch. In case of inclement weather, call the studio (856-885-4928) for announcements regarding studio closings. Studio closings will also be posted on our website, Facebook and, when possible, an email will be sent. If Monarch cancels a class, dancers will be responsible for arranging their own make-up classes. In the event of multiple cancellations, make-up classes will be scheduled during school breaks. No credits will be given for snow/inclement weather cancellations. I give permission for Monarch School of Dance to take photos of me or my child while participating in Monarch School of Dance activities, classes, rehearsals and performances for promotional purposes. Names of students will not be used or disclosed. I understand that I am giving permission to use these photos and/or videos for publishing use, in printed or electronic format. As the legal parent or guardian, I give permission to Monarch School of Dance, its owners and operators to seek medical treatment for the participant in the event they are not able to reach a parent or guardian. I hereby declare any physical/mental problems, restrictions, or conditions and/or declare the participant to be in good physical and mental health. Once you choose 'Submit' a $25 Registration Fee will be processed, this will reserve your dancer's spot in class. All multi-class discounts will be manually applied prior to first tuition installment.